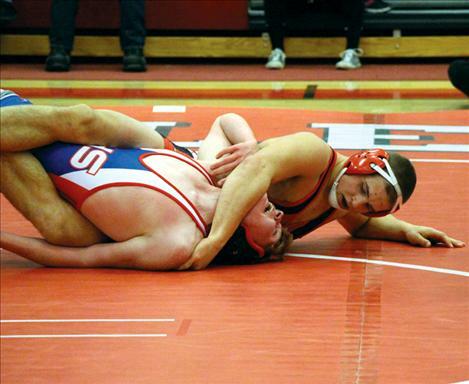 ARLEE – The Warriors’ grapplers picked up some wins on the mat this last week while hosting the Arlee Mixer. Teams from Plains-Hot Springs, Bigfork, Superior and Deer Lodge joined the Warriors’ Thursday wrestling in 10 weight classes as well as giving fans a few exhibition matches to cheer on. Harold Yocum, Daniel Dunlop, Kyler Clinkenbeard, Tyler Potts and George Shick all won matches with Shick coming away with two wins by pin. On Saturday the Warriors traveled to Superior to compete at the Bob Kinney Classic. Though no Warriors broke into a first place finish, Alex Bertollt grabbed second wrestling in the 170 weight class. TJ Knoll and Daniel Dunlop placed fourth in their divisions. Arlee will head to Eureka Dec. 20 before going into winter break. They will return to the mats Jan. 2-3 in Ronan.